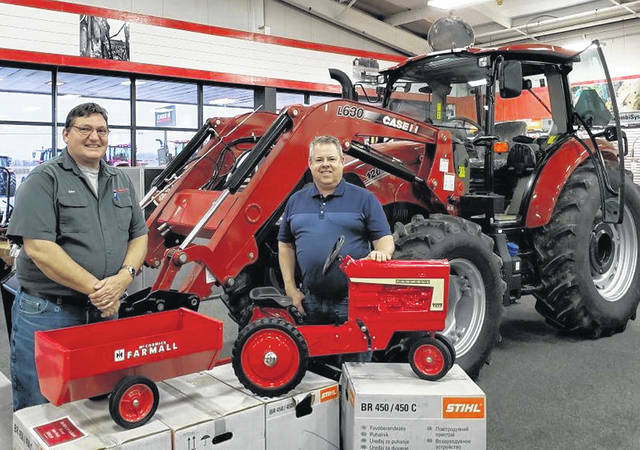 John Frazier, left, of Bane-Welker Equipment, and Ag Is Everyone’s Business committee member Brad Elmore are pictured with the Farmall pedal tractor and grain cart. 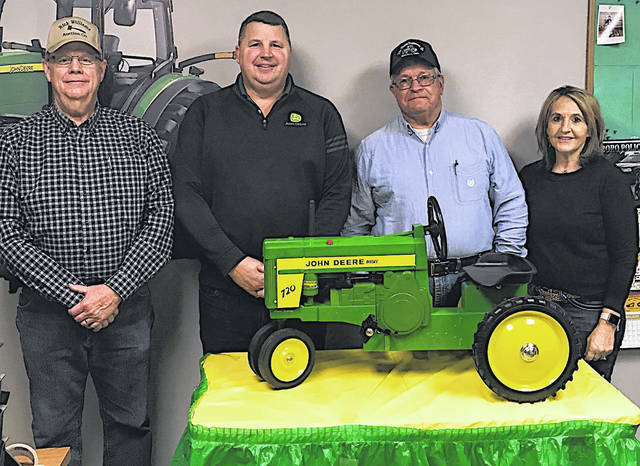 From left, Rick Williams, a Highland County Chamber of Commerce board member; Jeff Parry and Jeff Duncan, both of the Five Points Implement Company; and Melissa Elmore, executive director of the chamber, are pictured with the John Deere pedal tractor. 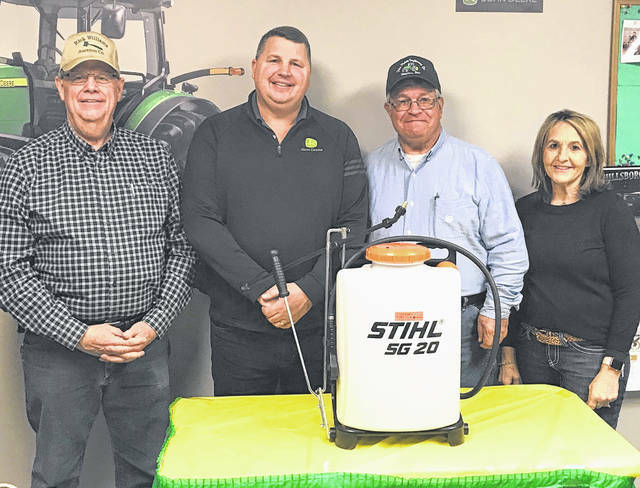 From left, Rick Williams, Jeff Parry, Jeff Duncan and Melissa Elmore pictured with the Stihl SG 20 Backpack Sprayer being raffled by the chamber. Ag Is Everyone’s Business is quickly approaching and tickets are still available. Returning to past tradition, the chamber will be holding a pedal tractor auction following keynote speaker Mark Gold address at the Feb. 8 event at the Southern State Community College Patriot Center in Hillsboro. There will be two tractors and a grain cart to bid on this year. The first tractor is a Case IH Farmall 656 pedal tractor. The grain cart is also a Case IH Farmall and matches the tractor. Both were donated by Bane-Welker Equipment in Wilmington. Tickets for the Ag Is Everyone’s Business can be purchased online at www.thehighlandchamber.com, at any Hillsboro Merchants Bank location or the Greenfield office, First State Bank in Hillsboro, and Southern Hills Community Bank in Greenfield or Leesburg. The cost is $20 for presale tickets. They will also be available at the door the day of the event for $25. Submitted by Erin Sheeley, Highland County Chamber of Commerce.